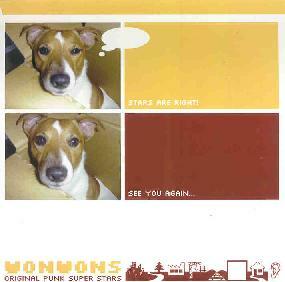 Wonwons - "Original Punk Super Stars"
Wonwons are a Japanese surf punk rock n roll band from Japan. I've got little info about them but I get the impression they are no longer in existence, having been active in the early 90's, The CD is only 24 minutes long but the Wonwons make their statement succinctly across the 11 tracks that make up this set. The first track is a classic 60's styled surf instrumental. But quickly thereafter they get considerably more down ‘n dirty, taking on a rawer garage surf sound with female "Yeah Yeah" vocals and an edge that brings to mind the Ventures plummeting to Earth in a damaged spaceship. On some tracks the band have a strong B-52s resemblance, though much punkier. And on others the guitars have a totally stoned space vibe to them. A fun set. And in case you're interested, "Wonwon" means bark of a dog in Japanese.